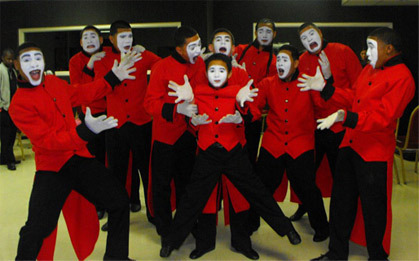 Get ready to view one of the most EXPLOSIVE and INNOVATIVE mime groups in the U.S.!!! From Florida, you will be blown away with what they present as they give glory 2 God!! Mas Que Vencedores (MQV) is a ministry composed of men from the age ranges of 5 to 28 who worships and praises the Most-High God in spirit and in truth through sacred hip-hop and mime. This ministry was founded in the year 2003 under the leadership of Fabiola Palacios; its name derived from Romans 8:31 which declares: “WE ARE MORE THAN CONQUERORS THROUGH HIM WHO LOVED US”. MISSION: To preach the gospel through the arts and win a generation that needs salvation, deliverance, and healing through the ONLY ONE that can offer it, and that is our LORD JESUS CHRIST. -What shall we say of these things? If God is for us, who’s against us? -Yet in all these things we are more than conquerors through him who loved us. Our Ministry mainly known as “M.Q.V” which stands for “Mas Que Vencedores” in Spanish and “More Than Conquerors” in English, is a Spanish ministry which has been serving God throughout the Arts. We are a ministry of about 12 men located in Hollywood, Florida. We are worshipers of God, that worship Him in spirit and in truth. We are a ministry that has been together for 8 years strong now and God has been using us to preach the gospel throughout our dance. Our dance styles include mainly mime and christian holy hip-hop. For any booking information please contact the numbers below and feel free to ask us about any of our upcoming events! May God Bless you all.